Do you need a special way to thank a special doctor? Or are you looking for a unique doctor birthday gift? This classic black wooden frame with personalized poem is a unique way to thank him or her. Say "Thank You Doctor" for going above and beyond with this thoughtful Poetry Gift. 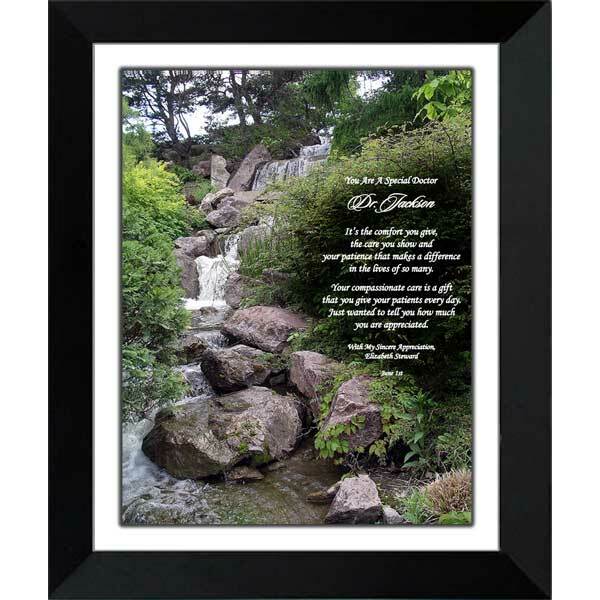 The impressive waterfall design along with the sincere verse will express your heartfelt appreciation. When this gift is personalized with the Doctor's name and a message from you, it becomes a unique personalized gift. in the lives of so many. that you give your patients every day. It was exactly what I was looking for. It arrived sooner than expected. Many items to choose from. I have been the recipient of several items from Poetry Gifts when my parents passed away. This is a long established company with great gifts to choose from.